For dry, oily, normal and combination skin. Removes traces of residue and supports the physiological pH value of the skin. It clears the skin and is pleasantly refreshing. 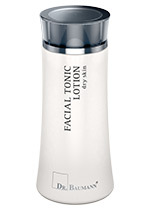 After application of a DR. BAUMANN toner the skin is optimally prepared for the moisturizer or treatment to follow.